With all the choices available in the world of outdoor living structures today, sometimes it can be a daunting task to know which outdoor structure addition will best fit your needs. In addition, there are many materials, finishes, textures and colors to select from. One of our goals as an outdoor living space design and building expert is to help educate you regarding material choices in order to help you make the most informed decision about your anticipated outdoor living addition. Two of our most popular outdoor living spaces are screened porches and three season rooms. We offer both wooden-framed and aluminum outdoor rooms designs. Each of these materials offers varied benefits while still providing the lifestyle enhancement and quality you have come to rely on from Archadeck of Central SC. We have put together a comparison of the benefits of wood versus aluminum when used in a screened porch or three season room addition. Wooden-framed screened porches and three season rooms are a good fit for creating a space with a natural feel. Wood is a substantial material when your tastes lean more towards the look of a traditional screened porch. Pressure treated pine is not a good candidate for painting. We recommend leaving it natural or applying stain to retain the rustic attributes of natural wood. 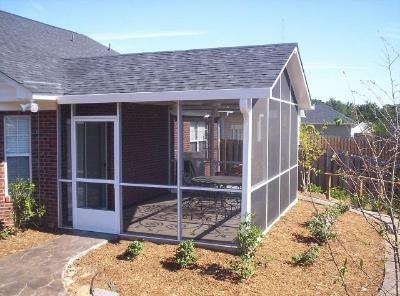 Even this Columbia, SC, homeowners’ cats love the screened porch! From a project timeline perspective, wooden-framed screened porches and three season rooms typically take a little longer to build compared to aluminum. However, for homeowners who love the look and presence of natural wood, it is well worth the wait. Our aluminum-framed outdoor rooms are custom-made to order and designed to match your home’s architecture and colors. Unlike other aluminum outdoor room companies’ that are built using a kit, we custom design your outdoor room according to your spatial needs, roof pitch and desired interior amenities. We offer both shed roof and gable roof designs that compliment your existing home. Our gable roofed designs allow for a shingled roof, which we match as closely as possible to your existing roof. Gable roofs also allow for higher ceilings within your outdoor room making it feel more open and airy. The build time for an aluminum outdoor room is considerably less than a wooden-framed one — which translates into being able to enjoy it sooner! In addition, maintenance is a breeze since the space will never require the laborious task of staining or sealing, there is no siding to replace in the future, and our shed roof designs don’t require shingles. Aluminum delivers a clean and sleek finish perfect for many of today’s contemporary homes. We offer four color choices in our aluminum outdoor rooms. These include bronze, white and two neutral tones that allow freedom in matching the new room to your home’s trim and architectural details. White remains our most popular aluminum color choice among homeowners in the Columbia area. Our outdoor rooms will provide years of enjoyment for you and your family no matter which material you choose to use. They will expand your living space and allow you to enjoy the benefits of the outdoors without the undesirable insects, dangerous UV rays and inclement weather. If you are ready to learn more about adding a screened porch or three season room to your home, contact Archadeck of Central SC today. We can get you started enjoying your new outdoor living space sooner than you ever imagined! Call today for a free design consultation at (803) 603 – 2160 or send us an email at centralsc@archadeck.net. This entry was posted in Aluminum and vinyl four season rooms and sunrooms, Aluminum three season rooms and screened porches, Customized Design, Outdoor living space design and building, Outdoor Rooms, Screened Porches, Three and Four Season Rooms, Wooden outdoor structure care and maintenance and tagged Central SC aluminum 3-season rooms, Central SC aluminum and vinyl 4-season rooms, Central SC aluminum and vinyl sunrooms, Central SC aluminum screened porches, Central SC custom aluminum and vinyl outdoor rooms, Central SC low maintenance 3-season rooms, Central SC low maintenance screened porches, Columbia SC aluminum screened porches, Columbia SC aluminum three season rooms, Columbia SC custom aluminum 3 and 4 season room additions, High quality aluminum and vinyl outdoor rooms in Columbia SC on November 25, 2015 by archadeckofcentralsc. Interior of gable roof aluminum screened porch in Lexington, SC. Archadeck of Central SC specializes in being able to provide quality outdoor spaces for homeowners with varied budgets and lifestyle needs. Three of our most popular outdoor room additions are screened porches and three and four season rooms. 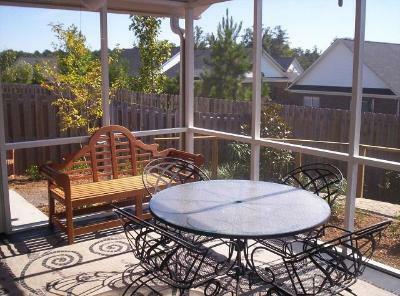 We offer a low-maintenance, budget- friendly alternative to traditional wood framed screened porches and 3 and 4 season rooms that still provides the lifestyle enhancement and quality you have come to rely on from Archadeck of Central SC. These are our aluminum and screen porches and three season rooms, and our aluminum four season rooms, which are built with vinyl windows. Our aluminum and vinyl outdoor rooms give you a luxury living space and are custom made to order and designed to match your home’s architecture and colors. Unlike other aluminum outdoor rooms that are built using a kit, we custom design your outdoor room according to your spatial needs, roof and interior amenities. We offer both shed roof and gable roof designs that compliment your existing home. Our gable roofed designs allow for a shingled roof, which we match as closely as possible to your existing roof. Gable roofs also allows for higher ceilings within your outdoor room making it feel more open and airy. 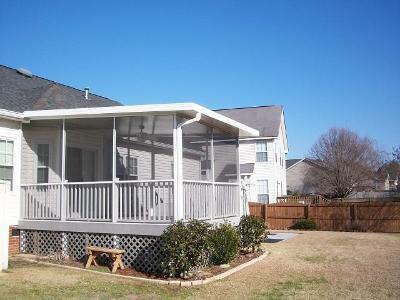 Aluminum shed roof screened porch addition in Irmo, SC. We offer four color choices in our aluminum outdoor rooms. These include bronze, white, and two neutral tones allowing greater freedom in matching the addition to your home’s trim and architectural details. White is our most popular aluminum color choice among homeowners in the Columbia area. Our screen system is durable and stays looking new for years. Opting to use our vinyl four-track window system will take your space a step further giving you complete control over how much window you choose to remain open or closed. 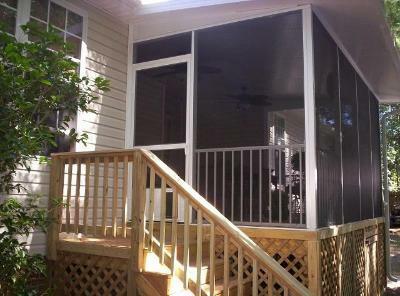 Pressure treated deck and aluminum screened porch in Lake Carolina by Archadeck of Central S.C. The lightweight nature of these rooms allows for many options that wood framed rooms don’t offer. While wood can add significant weight and therefore creates extra pressure on the house’s existing structure, many aluminum rooms can be added without significant modification to the existing structure. 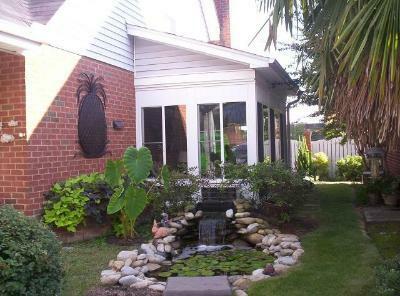 Because of the nature of the materials we use , your outdoor room is also very easy to maintain. The structure will require no painting; there is no siding to replace in the future, and our shed roof designs don’t require shingles. This sunroom addition in Columbia is set against a tranquil, lush landscape. Along with being ultra-low maintenance, an aluminum screened porch or outdoor room takes less time to build, which means you will begin enjoying the benefits associated with your addition sooner! 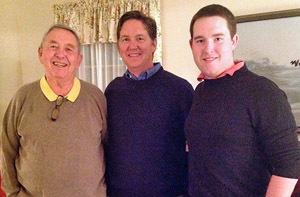 Our outdoor rooms will provide years of enjoyment for you and your family. They will expand your living space and allow you to enjoy the benefits of the outdoors without the undesirable insects, dangerous UV rays and inclement weather. You can see more examples of our aluminum outdoor rooms by visiting our screened porch photo gallery, and our three and four-season rooms photo gallery located on our website. This entry was posted in Aluminum and vinyl four season rooms and sunrooms, Aluminum three season rooms and screened porches, Screened Porches and tagged Central SC aluminum 3-season rooms, Central SC aluminum and vinyl 4-season rooms, Central SC aluminum and vinyl sunrooms, Central SC aluminum screened porches, Central SC custom aluminum and vinyl outdoor rooms, Central SC low maintenance 3-season rooms, Central SC low maintenance screened porches, Columbia SC aluminum screened porches, Columbia SC aluminum three season rooms, Columbia SC custom aluminum 3 and 4 season room additions, High quality aluminum and vinyl outdoor rooms in Columbia SC on September 24, 2013 by archadeckofcentralsc.